At OmniSocial Incorporated, the self-proclaimed industry leader in social media marketing, we recorded 250% annual growth and expanded our Seattle office by precisely 14.2%. “We’re extremely proud of our growth this quarter,” our CEO, William Lumbergh, told Forbes early this afternoon. That 14.2% translates to a single new hire, making our total headcount 8 employees. 7 of them are in sales and the 8th is in PR. With growth this spectacular, we expect to be valued at over a billion dollars very soon. When you double a portion of rice every day for 30 days, you get a lot of rice. When you double your revenue like our company does every 30 minutes, you become a Fortune 50 sensation on the cover of Time, and nobody at your 20-year high school reunion calls you a failure. Even if you didn’t go to prom. Pictured: Not you, loser. That’s me in the middle; everyone was my date. But that hasn’t stopped the biggest names in venture capital from funding our business. It hasn’t stopped us from paying a silly – so very silly – sum of money to distribute this press release everywhere from Palo Alto to Westeros. After all, it’s not like we can generate this kind of buzz through word of mouth. And, hey, press releases make investors happy like opiates make Lou Reed write songs. It’s not our money. 9 out of 10 Sean Beans agree – we’re awesome! The 10th lost his head for treason; I’m sure you can see why. Still, it is very important that you believe we are big and successful, because we only have 200 active users on Facebook. Actually, make that 192; our social intern just argued with a customer on our wall. But we can proudly say that 7 of the top 10 brands on Facebook have used us. Which ones? The big ones of course. And, we lost them all. What you can be sure of, though, is that our cold-callers are more aggressive than the cast of Jersey Shore. Oh, they’ll wake you up in the middle of the night. They’ll do it until you convert. We all have to make our numbers, right?! And, please, allow us to scan your badge at the trade show. We need all the leads we can get. Also, didn’t anyone tell you the morning keynote was moved to our booth in the exhibit hall? Well, it was, and you better not miss it. You’ll also notice that the evening cocktail reception is only available to attendees who signed up for our free trial. The liquor is all top shelf, so I strongly recommend you give us a try. 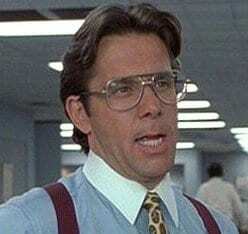 After all, we currently deliver no fewer than 5 widgets in our TPS reports. 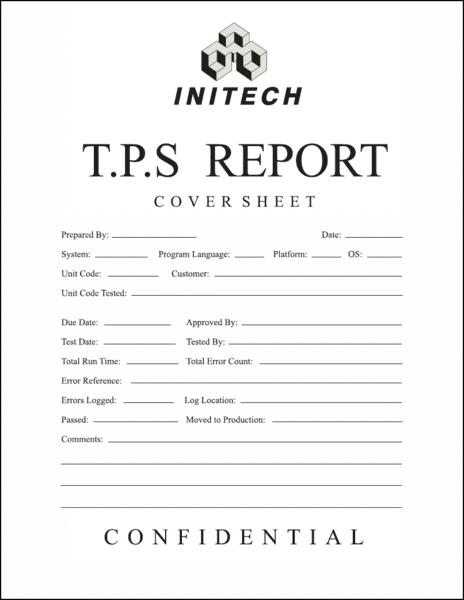 It’s a much cleaner reporting experience. 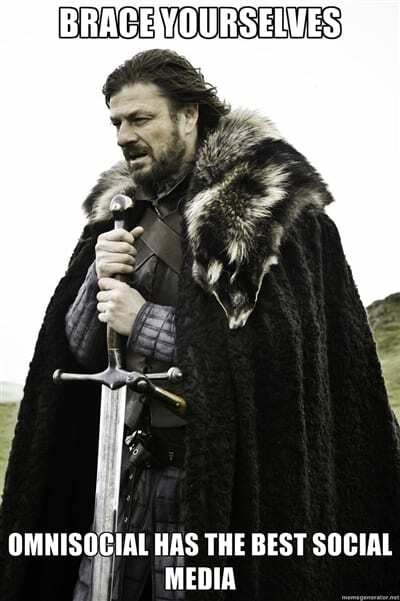 And in our next release? We’ll have 6 earthshattering widgets in every last one. We won’t forget the cover sheets, either. Yes, I got the memo. That’s right; 6 widgets. Can’t be done? Say that to my face. We’ll have pie charts in every variety – from apple to boysenberry – and our offshore team told us (in broken English) that our reports are built with HTML5, use responsive design, have a lot of big data and open graphs, and are WTF compatible. The last one’s important. Haven’t heard of it? It’s proprietary- Don’t ask about it. Forget I ever mentioned it. Does all of this bold text make us more sound more official? Good! Have some more! Using our advanced real-time technologies, we’ll measure the value of your social presence. Last year, we said Facebook fans were worth $123. This year, they’re worth $174. Don’t ask to see our math; we didn’t show our work. Just trust us, OK? We’re experts. Pictured: Our expert. We pay him 100k / hour. That’s how good he is, and that’s why you should trust us. 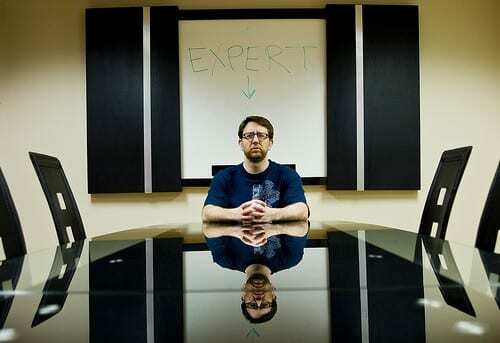 See, it even says EXPERT with an arrow pointing at him, so you know it’s official. Just know that if you use our platform, you’re instantly worth 41% more, even if you don’t have any fan growth, revenue spikes, or real business metrics to show for it. Forget about Web 1.0 metrics. We’re in Web 5.0, son. It’s all about reach, impressions, +1’s, and other stuff with vague business value. But our beautiful real-time charts, optimized for your iPad viewing pleasure, will distract your bosses long enough for you to get a promotion and speak at industry conferences. You’ll meet other people like yourself, and you can reaffirm one another. You’re just fine! You’re just fine, too!